I am no longer anywhere near Grouse Ridge. Eric dropped me off at the PCT trailhead at Donner summit last night. I decided hiking out together was preferable to being left behind. We stopped at the Summit Inn in Norden for dinner and I had a half pound burger with enough carbs in it to power me up the switchbacks to where I camps last light. I arrived here just as the final light of dusk was fading. The time of twilight where it's easy to believe in Bigfoot and you're pretty sure he's watching you. I resisted the urge to run screaming down the trail and began to unpack. When I left the trailhead I was a bit chilled. I knew that I had five hundred feet of elevation to climb so I began going as fast as I good. Being close to interstate 80 meant that my phone reception was good so I called Kelli. We talked until I walked around the corner and I lost reception. The whole time I was huffing and puffing because of the steep trail and speed I was going. I was quite warm when I arrived, but that didn't help me as I began making a series of mistakes as I set up camp. Perhaps it was my concern with getting everything done before I lost all light, or perhaps it was Bigfoot unseen but felt presence. I debated with myself as to whether to hang my food and the more worried part of me won. I pulled out my bear bag line and began to untie the knot that I use to keep it from being tangled in its storage bag. I have no idea what I did but suddenly it transformed itself into a pile of spaghetti. Except it was all one noodle. I was faced with the proverbial and literal Gordian knot. Here I am I can barely see and thinking doss it matter? Will a bear actually show up and steal my food? I am tired and sweaty and it's getting dark. I don't have time for this. I took a deep breath and fished out my headlamp. For the next fifteen minutes I slowly unraveled the mess. It was quite dark when I finally finished. Fortunately I found I suitable tree and took care of my food in the safe responsible way. I quickly through all my stuff into my tent since lit was now dark. Then I grappled my camp towel and rushed down through a bunch of bushes to a small stream to wet it down for my evening wash down. When I got back to the tent I sat down inside and took off my shoes. As I swung my feet inside I noticed the my hand, which I had placed on the floor of my feet to assist in the swinging, was soaking wet. 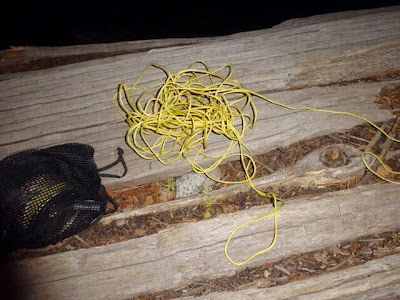 When I had carelessly tossed my gear inside my water bladder, with its ingenious bite-tube end was on the bottom of the pile. My other gear applied enough pressure to release about a cup of water. The floor of my tent was a puddle. My phone, hat, stuff sacks, and other gear were sitting in a puddle. Oh no my phone! I left my life proof case at home and my zip gone is going commando. Right into to puddle. Fortunately it seems to have survived. But I spent another thirty minutes sopping up all the water. By the time I was done I was too tired to try to blog. So here I am laying in my tent while daylight is burning. That's all for now I got a trail to hike.